16Mpix —the smallest pixels available on a micro-four-thirds sensor! The low-light ISO score of 703 is comparable to other micro-4/3 sensors, and DxOMark measurements show that the micro 4/3 sensors are not the best in lowlight conditions. When comparing the Panasonic GX1 vs the Panasonic G3, another micro-four-thirds camera in the same line, we get the exact same behavior. But, this was to be expected as both cameras are build around the same sensor. We see here that the GX1 has some serious competition. The GX1 scores slightly better for low-light and dynamic range than the Olympus Pen EP3 – and while the differences are slight, they clearly show that the GX1 has one of the best 4/3 sensors currently available. This all said, the Sony NEX 5N – itself a hybrid – is technically better in every respect, thanks to its APS-C sensor. To conclude, the Panasonic GX1 is an intuitive, easy-to-use hybrid, and a good, compact choice for fans of beautiful photos. Its only real problem is its significant loss of image quality at high ISO. 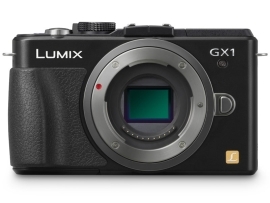 Panasonic has taken something of a lead in terms of compactness, thanks to its offering of pancake lenses that can make cameras like the GX1 truly portable. We will be testing the optical quality of these kinds of lenses, in particular the Panasonic LUMIX GX PZ VARIO 14-42mm, the LUMIX GX PZ VARIO 45-175mm and the Panasonic Leica Summilux DG 25mm F1.4, in the foreseeable future. Finally, what to choose when faced with cameras using current 4/3 sensor technology or cameras using APS-C sensors, especially now that the latter is not particularly more cumbersome than the former? There are still a lot of questions about micro-four-thirds sensor technology, and we expect that a lot more ink will be spilled in lengthy discussions before there are any definitive answers, especially with Canon launching the G1X featuring a sensor slightly larger than a micro-4/3.